ADAM’S LADDER – 82% FUNDED! Update, as of 11:00am, 09/20/17: We are nearly there! Adam’s Ladder is now 82% funded, thanks to your generosity, and to an incredibly lucky campaign backer who snagged the signed Stephen King book. Along with pre-ordering in eBook, trade paperback, and deluxe hardback, there are a few editing and book design packages available, but they are going fast. There is even a $4 option for coffee lovers, and rare/signed books available now and again throughout the campaign. Help us get to 100% so we can bring this book to life! Once completely funded, unlocks will be made available to offer campaign-backers free books as our way of saying thanks! To see how you can help, click the image below, or anywhere you see Adam’s Ladder. This is an all-or-nothing campaign. Written Backwards has taken over production of this book from another publisher, so pre-orders are vital in bringing this book to life, and to assure that writers and artists are paid professionally for their work. Upon reaching 100% funding, Adam’s Ladder will immediately go into print production, with trade paperbacks and ebooks available in October, and the hardbacks in November. So, you won’t have to wait long to receive your books. If you are thinking about pre-ordering the deluxe hardback, please note that only 100 of these will ever be produced, so they will be quite the collector’s item. The 100-numbered limited hardcover edition of Adam’s Ladder, signed by editors Michael Bailey and Darren Speegle, will be bound in black leatherette, with silver foil stamping on the cover and spine, a full-color wraparound dust jacket, and printed on 60# natural offset paper. 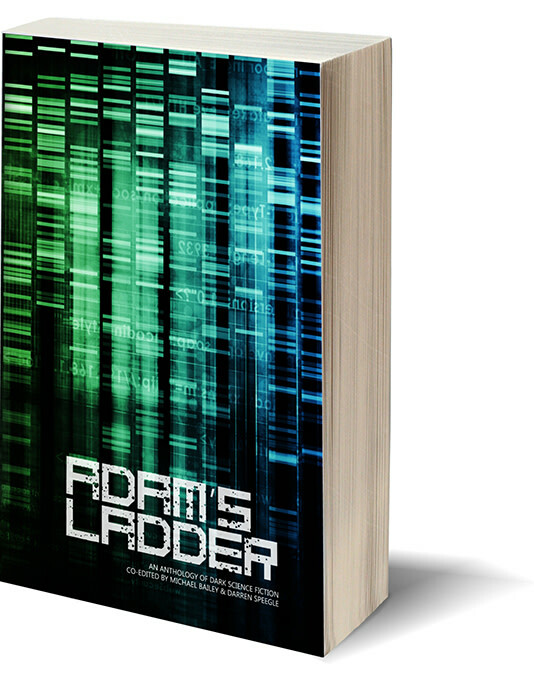 Those pre-ordering the hardback will also receive a trade paperback of Adam’s Ladder, as well as the eBook. And if we reach our unlock goals, you can expect up to two additional free trade paperback books and an eBook of the next anthology by Written Backwards, for as little as $95. Support small press, and we will keep cranking out quality fiction! Written Backwards is taking over the production of Adam’s Ladder, an anthology of dark science fiction co-edited by Michael Bailey and Darren Speegle, but we need your help to bring this book to life! To help fund this project, an Indiegogo campaign has been established and will now through October 15th. This is an all-or-nothing campaign, so help out if you can. Full funding will assure that all contributors receive professional payment for their work. And upon funding, campaign backers won’t have to wait long to receive their book orders. The trade paperback and eBook are scheduled for release in mid- to -late-October, with the deluxe hardback available in November. Click the Adam’s Ladder cover below to visit the Indiegogo campaign. What is to Become of Humankind? Adam’s Ladder will be published in eBook, trade paperback, and in a 100-numbered / limited edition (signed by its editors, Michael Bailey and Darren Speegle). Does it have a book trailer? What will the trade paperback look like? What is to Become of Written Backwards? Over the last ten years, Written Backwards has published multiple award-winning anthologies, fiction collections, and standalone novels and novellas, ranging from dark science fiction to horror. Previous anthologies include the Bram Stoker Award-winning The Library of the Dead, the Benjamin Franklin Award winning (and Stoker nominated) Qualia Nous, and three volumes of Chiral Mad (the latest also up for a Stoker). Books published by Written Backwards have seen eight individual works nominated for the prestigious Bram Stoker Award, with three of those stories taking home the statue. Other stories/poems have been nominated for the Nebula, the Rhysling, and others. Foreword Reviews Book of the Year, the Indie Book Awards, the Independent Publisher Book Awards, the Eric Hoffer Book Award, the International Book Award … Written Backwards titles have seen over two dozen literary accolades over the years through its handful of titles! But we need your help bringing the next project to life: Adam’s Ladder. Seek out diverse voices, both new and well-established. Pay writers, poets, and artists professional rates. Design and publish some of the most beautiful books imaginable. What is to Become of this Campaign? 63.64% – goes directly to the writers, which includes professional payment at a per-word rate, plus the cost of contributor copies for the various editions of the book. 31.22% – goes directly to publication costs for the eBook, trade paperback, and hardback editions of the book. And that’s it. Zero profit will be made from this campaign. Any additional funds raised will go directly to future Written Backwards projects, some of which are already lined up as expansions/unlocks within this campaign. This is an all-or-nothing campaign, so if it doesn’t reach it’s goal, the project gets canned. Anthologies (let’s face it), are expensive to make (but we all want them), mostly because there are so many incredible contributors involved. We need to raise $6,500 to make this book happen, so we’ve come up with some enticing perks. Written Backwards has some tricks to bring you even more great (and FREE) books in the form of campaign unlocks and future anthologies. 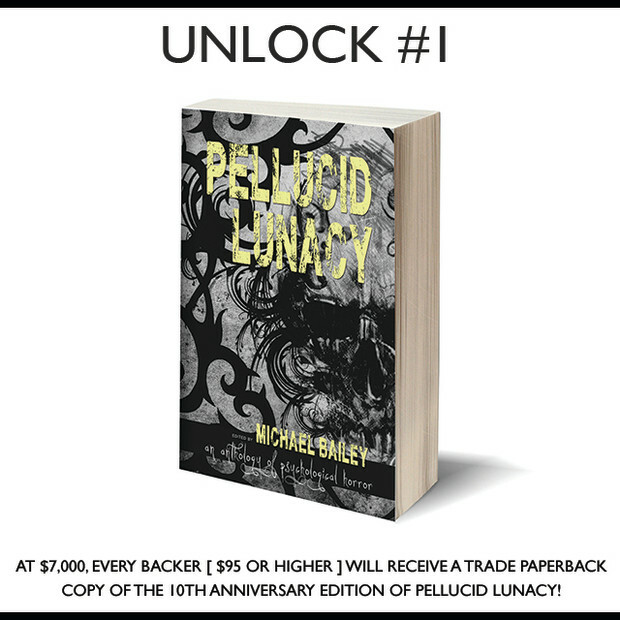 Pellucid Lunacy was the first anthology published by Written Backwards, and after ten years, the book is getting a face-lift. When the campaign reaches $7,000, all backers (contributing $95 or higher) will receive a complimentary copy of the trade paperback! 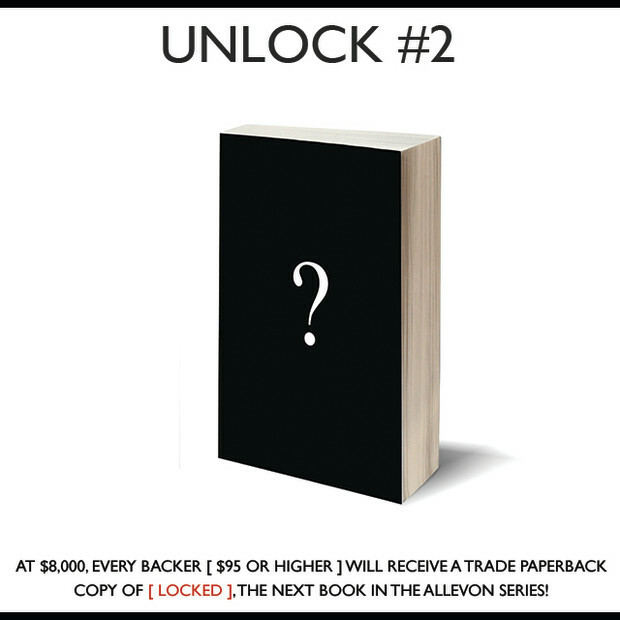 The title and author of the third illustrated book in the Allevon series by Written Backwards will be revealed when the campaign reaches $8,000, and all backers (contributing $95 or higher) will receive a complimentary copy of the trade paperback. The title and tentative cover of the next dark science fiction anthology by Written Backwards will be revealed when the campaign reaches $12,000, and all backers (contributing $95 or higher) will receive a complimentary digital copy in either PDF or EPUB. ADAM’S LADDER, a dark science fiction anthology I co-edited with Darren Speegle, is coming soon from Dark Regions Press. This is the follow-up to DRP’s highly successful return to science fiction with last year’s anthology, You, Human, and Marc Levinthal’s debut novel, Other Music. We’re hoping for an August release for the trade paperback edition. What is to become of man?